The Takena School playground is in the background of this mysterious boulder, which had a reader wondering about its origin. 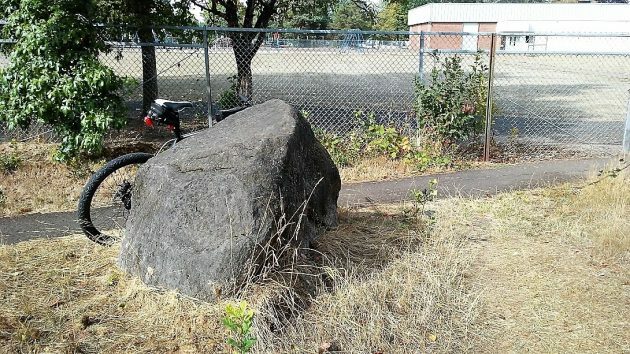 Over the years, I’ve probably passed this boulder in west Albany dozens of times, but not until a reader asked me about its origin last week did I take a closer look. The reader, Rhea Graham, wondered if this rock could possibly be one of the “glacial erratics” deposited up and down the Willamette Valley between 20,000 and 15,000 years ago during the Missoula Floods. I can’t say for sure. But after a quick tour through various online resources, I would say it’s possible, even likely. The Missoula Floods happened during the last Ice Age. The ice sheet coming south blocked a river in Montana, which formed a huge lake. The ice dam burst dozens of times, unleashing monstrous floods that raced down the Columbia and backfilled up the Willamette, covering the valley to a height of 400 feet above sea level. Icebergs floating on this lake carried rocks of all sizes, including very big ones, and dropped them when the waters went down and the icebergs melted. Ira S. Allison, chairman of the geology department at Oregon State College, described all this in a paper in the 1930s. In a 1953 report published by the state (DOGAMI), Allison referred to silt deposits associated with “iceberg-rafted erratics” in the Albany area. 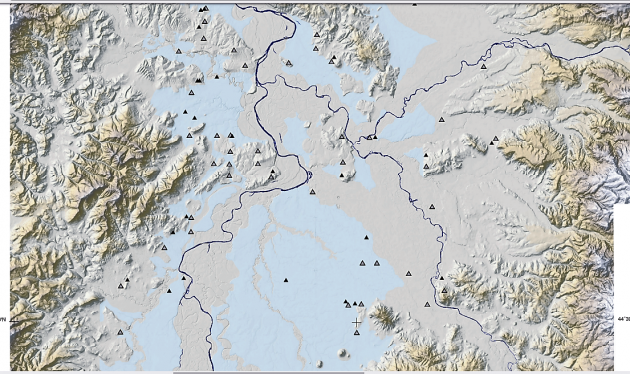 There’s a map, published by the U.S. Geological Survey in 2003, showing hundreds of erratics along the length and breadth of the Willamette Valley. It shows one such rock in Albany south of the river, albeit not in West Albany but on the east side of town. This map from a 2003 USGS report shows ice-rafted erratics in the mid-valley. 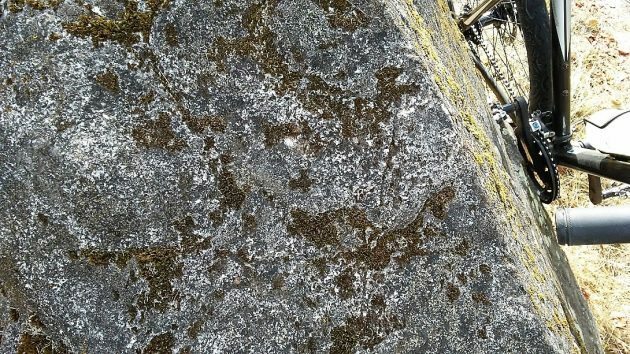 Up close, the Albany boulder shows lots of moss and also what, intriguingly, looks like inscribed lines. I have a Missoula Flood glacial erratic that I got from near the mouth of Berry Creek near its entrance to Soap Creek in Polk County many years ago. It has been my doorstop ever since. Thanks for quoting Dr. Allison on this. I met him only once, in his 90s. The Missoula Floods can also be reasonably referred to as the Bretz Floods. You might also want to consider doing an article on him in this regard. We have several of the glacial deposited rocks we have dug up out of our fields. The biggest that i am aware of is at the Jenks hatchery entrance. I wonder if the two big rocks with the numbers ’88 and 00 carved on them in the Central School yard are similar rocks. They’re on opposite sides of the walkway to where Albany College once stood. The two big rocks in front of the main entrance to Building 1 at The Linn County Willamette Health Dept. on S.E. Pacific Blvd. in Albany (formerly Willamette Industries’ buildings) were brought in by landscapers during a landscape remodel years back. But, I don’t know where the landscaper got them. David Abarr writes: “The corner house at 4th and Calapoolia is known to be 1858 making it a homestead house which of less than 200 are still standing according to Restore Oregon. This makes it the second oldest house in Albany after the Montieth house. So it is of historic significance. One can argue the merits of historicity. Some folks care. Some don”t. The only real question of merit is; who gets to do what with the property? Is it the legal owner, or is it a clutch of self-selected historians who are mightily convinced their beliefs outrank all others. In the end, since the homes in question are held privately, the thousands of interested and utterly charming history buffs currently prowling Albany in search of an Historical High only reachable by entering and examining the sagging structures are rebuffed. If the Landmarks Commission is truly interested in preserving Albany history then perhaps they ought pony-up the cash necessary to complete their Elysian Dreams.